He stayed in Estoril for periods of time up until, 1955 when he entered, La Academia General de Zaragoza for military cadet training. He describes those years as some of the happiest in his life. In 1962 he married the Greek Princess, Sofia, in Athens. There were two ceremonies, the first being Roman Catholic and the second Greek Orthodox. The first of his children, Elena was born in 1963 and then came Christina, in 1965, and finally Phillip in 1968. They led a quiet and simple life, knowing however, that their young family and often private life would change forever with the promise of a Spanish throne. 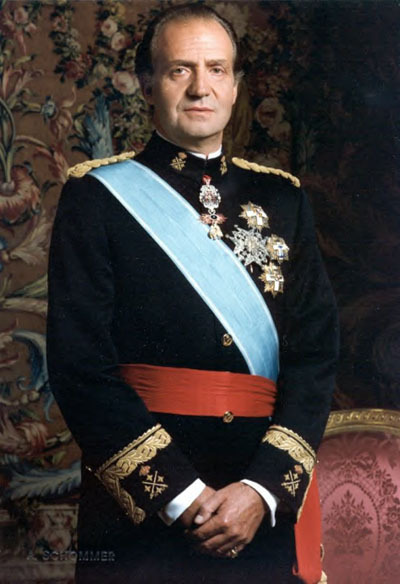 Don Juan Carlos took the throne on the 22nd of November 1975 after years of training and subtle integration with Spaniards because of his frequent visits to the country. His first speech was dedicated to the reinstatement of democracy and his oath to be king of all Spaniards, without exception. This was very shortly after the death of General Franco, who had kept his 1936 promise to the Monarchists that a, Bourbon would return to the throne one day. Above are the facts, but there are many stories about King Juan Carlos that are not so publicly known. I remember talk of a king coming. I was a child and thought it very romantic at the time. I also remember that where I lived in Denia, the people didn’t want him back and many still resent him to this day. In a previous blog, I spoke about the attempted coup on the 23rd of February 1981. We had a small television and watched the king on a live broadcast, which was repeated throughout the days that followed. His plea for calm and trust in the government went down well. His speech earned him respect from many quarters but I say again, there is a large portion of the population who would like an end to the Spanish Monarchy. He has, I believe, tread a very thin line since the day he was crowned. He is a modest King because he had to and still has to be as far as his financial wealth is concerned. He has been instrumental in the insurgence of various charities, although his recent faux pas concerning the shooting of an elephant in Africa did him no favours. He was at that time head of wildlife preservation and was after the elephant killing fired from his position and worse, gave ammunition to those who would see an end to him. I have had the pleasure of dining with King Juan Carlos in Marbella a few times. He is a very good friend to, Crown Prince Salman of Saudi Arabia, whom I worked for over a twelve year period. I noticed three things about him. He has a genuine love of children. He is a good conversationalist, and loves his country. He is now Seventy six years old and although he is relatively young, compared to Queen Elizabeth, his son, Phillip is probably the most trained and ready heir in Europe. King Juan Carlos sees his family ruling Spain for the foreseeable future and beyond. Spain and her people will decide if the Spanish monarchy remains for it has always been made clear that he serves at the will of the people and holds very, very little sway in any Spanish politics or policies.